A standard type of USB connector that was - at one time - commonly found on phones, cameras, and similar small devices, for connecting those devices to computers and other devices. Mini-USB is one of several sizes and types of USB connectors. Mini-USB has generally been replaced by the smaller micro-USB on new devices as of 2013. Almost no new devices include the Mini size connector. 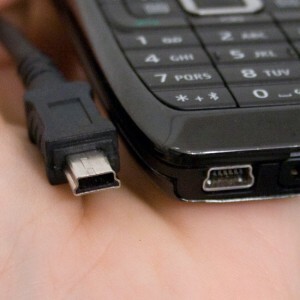 The most common use was connecting a phone to a computer, although some phones support charging via USB and/or connecting the phone directly to a printer. Some phones also have a proprietary way to support audio (for headsets) via this connector as well.